Not every gardener can grow a lemon tree, but everyone can have lemon scent and flavor in their garden by planting some lemon scented herbs. It’s amazing how much these plants mimic the essence of lemons. They are all relatively easy-to-grow and care for and the leaves, the most flavorful part of these plants, can be harvested and used in just about any culinary dish you prepare in your kitchen: teas, seafood, pesto, dessert... Even if you don’t think you’ll be cooking with these lemon scented herbs, it’s wonderful just to have the fresh scent of lemon when you are working in the herb garden. Lemon balm has an intense lemony scent, but the flavor is surprising sweeter than the scent leads you to expect. It is easily adaptable and can quickly become a nuisance in the garden, spreading underground by rhizomes. Frequent thinning is required to keep it in check. Otherwise grow lemon balm in a container.Well draining soil and plenty of sunshine should keep your plants growing well. I have never seen an insect pest bother it. Frequent harvesting will result in bushier plants. The panicles of white flowers are especially popular with bees. An easy way to add lemon scent to your herb garden is to grow lemon basil. Lemon basil will do well where ever regular basil grows. You can even start it from seed. The leaves tend to be small and profuse, so it’s easiest to simply chop some of the tender stem along with the leaves. Basils like full sun and regular watering. They don’t like to be left dry, especially while establishing. The more you pinch and harvest your basil, the more you will have. If the plant should get ahead of you and set flowers, don’t worry. Even basil flowers are flavorful and edible. I don’t think too many herb gardeners grow catmints for their own culinary purposes. If you have cats, you’ll be happy to know that they aren’t usually fond of the lemon scented catmint. Catmint can be a messy, sprawling, floppy plant, so don’t be hesistant to harvest and cut it back hard. Lemon catmint is a bit better behaved than the common ornamental catmints. This lemon scented herb grows to about 3' tall and has winter flowers in mid-summer. Lemon catmint is best used as a tea. USDA Zones: 3 - 9. 3-4' (h) x 12 - 18" (w). 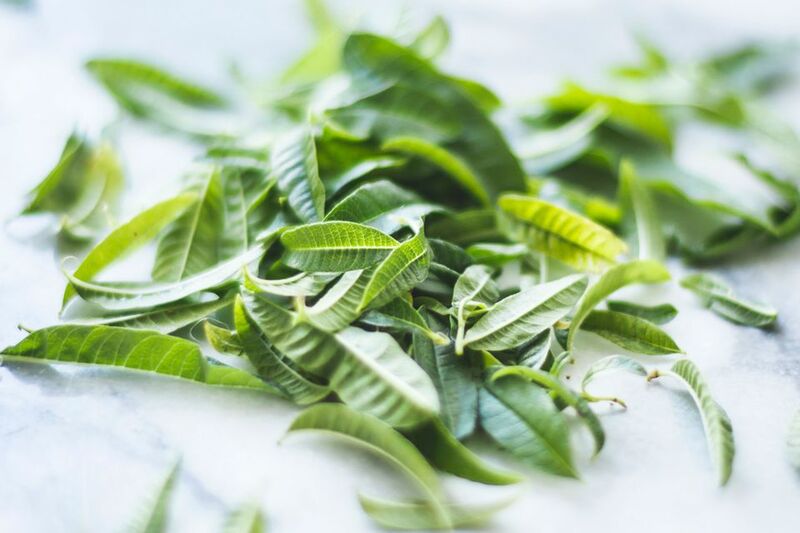 Of all the lemon scented herbs, lemon verbena has one of the truest lemon scents. It is a tender perennial. In a tropical climate, lemon verbena can easily reach 20' or more. USDA Zone 8 can expect a small shrubby plant and if you garden where it freezes in the winter, grow lemon verbena as an annual. Lemon grass is the lemon scented herb that gives so many Thai dishes their distinct flavor. Lemon grass is a tender perennial with bulbous stems and lemon scented leaves. Lemon thyme is as easy growing as you’d expect from a thyme. My problem with growing many types of scented thyme is that they all start to resemble one another in both scent and appearance. But I like the variegated leaf lemon thyme (Thymus citriodorus 'Variegata'). It has more substantial leaves with gold and green variegation, which make it a nice ornamental too.